With all of its history, allure and romantic charm, Venice can overwhelm the average traveler. There are so many fascinating attractions, restaurants and museums to explore, one needs at least a week to experience the enormity of Venice — the city on the lagoon. Sadly, many short-term visitors breeze through for just a day or two’s hit and run before embarking on a cruise or boarding a train for elsewhere in Europe. Even with that limited amount of time, they inevitably join the long lines at the city’s number one attraction — Saint Mark’s Basilica — or spend €80 for an expensive but short 40-minute gondola ride. There is a right way and wrong way to visit Venice’s number one attraction. If you are visiting between April and November, you can beat the lines by reserving an online pass for just €3. The best time to go is 9:45 a.m. when the Basilica first opens. It is hard to believe that initial construction of the Basilica began in the year 978 CE and the original building was completed in 1092. Entering the Basilica is a jaw-dropping experience as you see the massive ceilings, domes and bright gold mosaics. Bring Euros with you as some attractions inside the Basilica have additional fees. Tickets to access St. Mark’s Museum, the Golden Pall and the Treasury of St. Mark’s Basilica can be purchased only on the spot at the time of your visit. This incredible museum is located in Peggy Guggenheim’s former home, Palazzo Venier dei Leoni, on Venice’s Grand Canal between the Academia Bridge and the Church of Santa Maria della Salute. 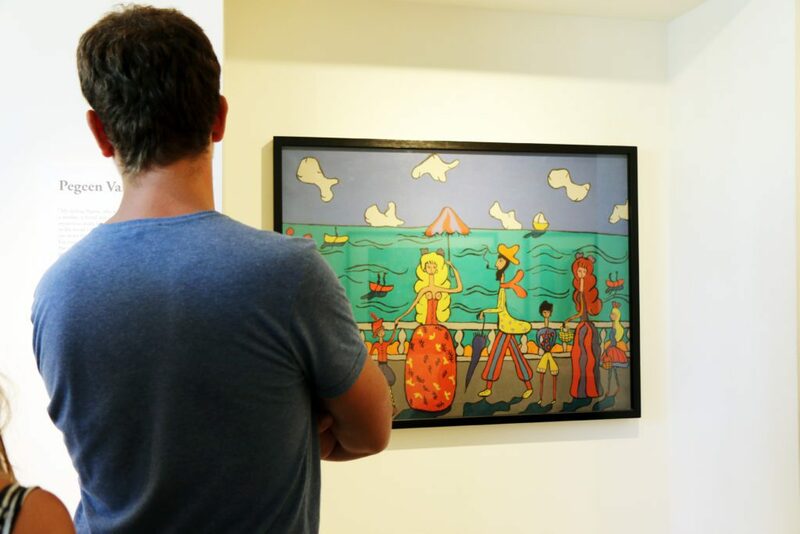 The museum showcases the personal collection of Peggy Guggenheim, who began supporting emerging artists in the 1930s by purchasing at least one painting. She is said to have become an art addict in 1939 when she started buying a painting a day. This impressive collection is one of Europe’s best and holds significant works of Cubism, Futurism, Metaphysical painting, European abstraction, modern sculpture, Surrealism and American Abstract Expressionism, by some of the 20th century’s most celebrated artists. Original works by Picasso, Dali, Gorky, Pollock and many more renowned artists visit the museum a must! After her death, The Peggy Guggenheim Collection became part of the Solomon R. Guggenheim Foundation, which owns the Guggenheim museums worldwide. Quite a few temporary exhibits are hosted during the year. This exhibition presents the relationship between the forms and design of pre-Columbian monuments and the art of Josef Albers (1888 – 1976). The show features a selection of rarely shown early paintings, iconic canvases, and works on paper, and also includes a rich collection of photographs and photo collages, many of which have never before been on view and were created by Albers in response to frequent visits to Mexican archaeological sites beginning in the 1930s. The museum has a café as well as a gift shop full of books, posters, and souvenirs. The outdoor sculpture garden features a gazebo where Peggy Guggenheim often enjoyed her breakfast. She and her fourteen beloved dogs are buried nearby. This hip restaurant is situated between the Rialto Market and the Peggy Guggenheim Collection in an ancient terracotta Venetian palace overlooking rows of gondolas and the Grand Canal. It features indoor and outdoor seating, and in the summer offers value-priced touristic (three-course) lunch menus for €15. The waiters are friendly and wine knowledgeable. Vinaria’s artful marriage of modern and traditional décor, enclosed in old stone walls, hints at the adventurous menu offered. The cuisine has an eclectic Venetian flair, with perfect flavors and textures! The wine list focuses heavily on Italian wines but gives the nod to German, French and Slovenian producers as well. Vinaria Ristorante & Pizzeria – ✭✭✭✭✭ 5 Stars! 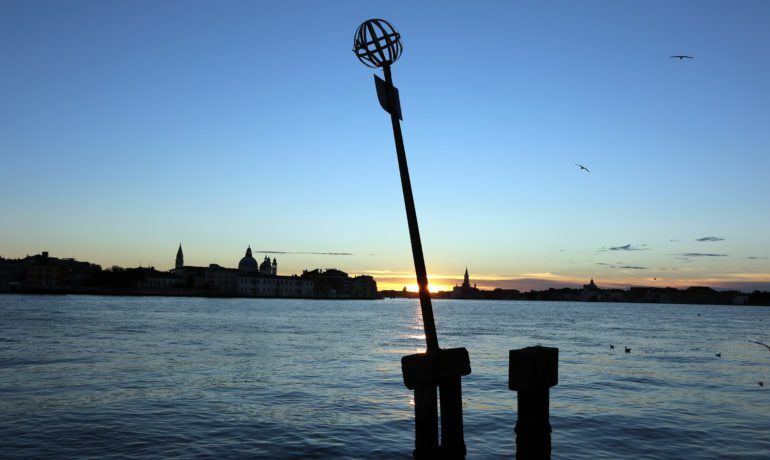 Giudecca is an island in the Venetian Lagoon, south of the main island. Most tourists never visit because it involves taking a Vaporetto or private water taxi. I prefer staying in Giudecca because it has a more local feel with an excellent view of the overly-crowded main island. If you wish to stay at a hotel, there are several excellent options! 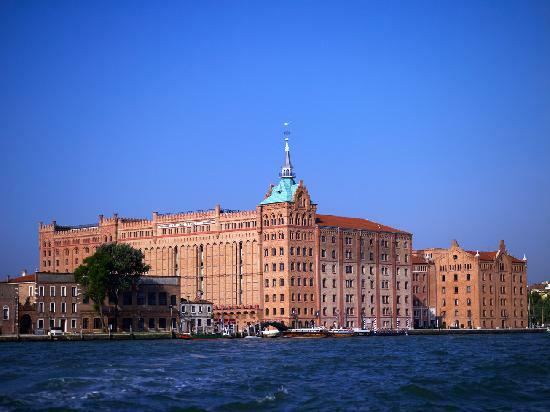 Hilton Molino Stucky is a 5-star hotel with an incredible view. Once a small flour mill, it was converted into a luxury hotel with well-appointed rooms, great restaurants and a fantastic rooftop pool and bar. Negroni’s on the rooftop will set you back €15, but the view is breathtaking. King rooms average €200 per night. 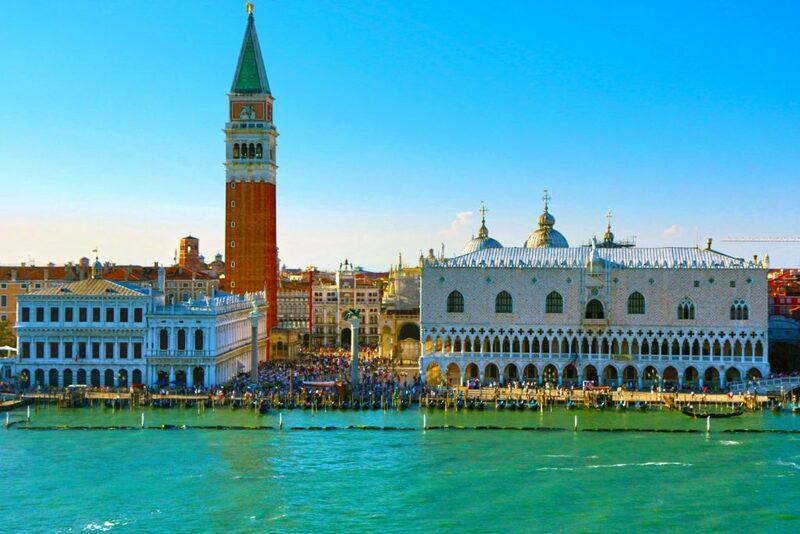 They also have a complimentary hotel waterbus to St. Mark’s Square (Piazza San Marco). Note: If you are taking a cruise, there is a particular waterbus stop in front of the hotel with quick service to the cruise terminal. Hotel Giudecca Venezia is a 4-star hotel located on a canal in the middle of Giudecca. Room rates start at €100 per night. 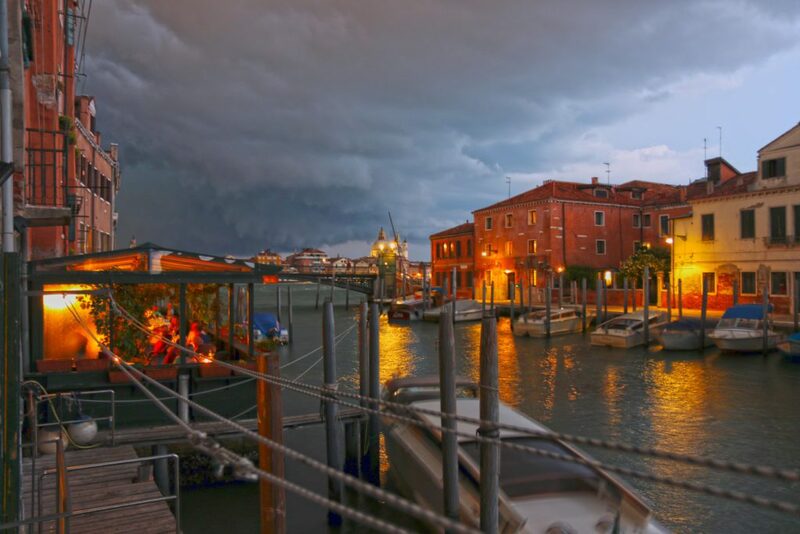 Giudecca has many options for apartment rentals. If you are bringing your family, or another couple is traveling with you, apartments are much more cost-effective than hotels. You can find listings online at Airbnb (www.airbnb.com) or HomeAway (www.homeaway.com). It is essential that you do your research and carefully read customer reviews. If you are planning to travel in the summer, make sure your apartment has good air conditioning — central air conditioning in all rooms is a must. Summer rentals average $130 per night and higher. Note: There are a big grocery store and several small food purveyors (vegetables and fresh seafood market) on Giudecca for stocking your kitchen with food and wine. This is one of our favorite restaurants in Venice because it is reasonably priced and never disappoints. Ristorante Al Storico da Crea is off the beaten path, located in a boatyard on the south side of the island near the Redentore Waterbus stop. Follow the signs and walk through an alleyway to the boatyard, where you can see water. The restaurant is located on the second floor of a storage warehouse. To get there, you take a long metal staircase up to a deck with tables overlooking the water. There is also an elevator around the other side of the deck that takes you from street to deck level. The décor is appropriately nautical, with whitewashed walls, ships’ wheels, miniature ship replicas, a wooden bar and fish art on the walls, and the staff is quite friendly and accommodating. For such a tucked-away restaurant, it boasts an impressive wine list but also serves quaffable local wines (Vini di locale) by the half-liter pitcher for €6. 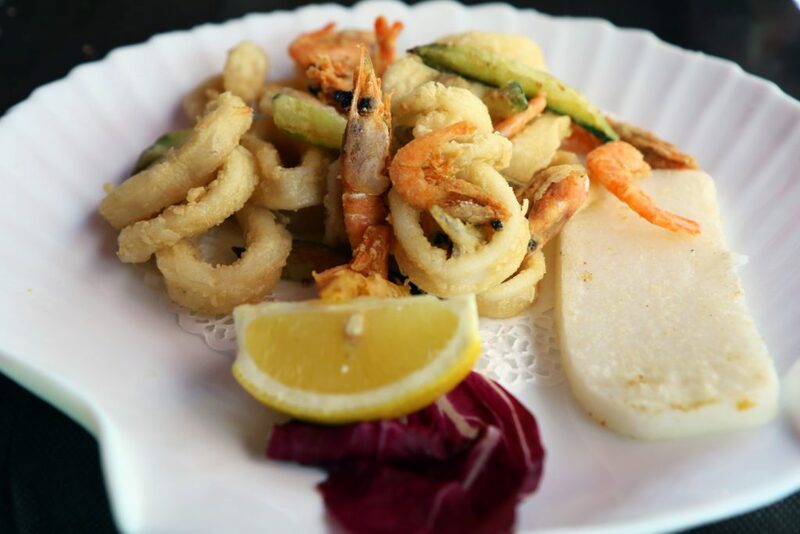 As you would expect, simple, ultra-fresh and tasty seafood dishes are their specialties. For example, appetizers include marinated octopus with prawns. 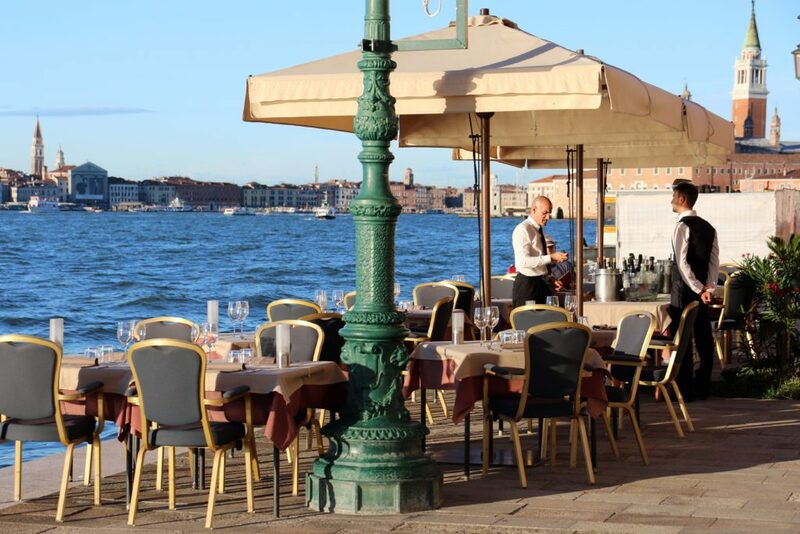 The restaurant overlooks the lagoon, which offers a serene view and atmosphere, in marked contrast to the massive crowds just across the water in St. Marks Square! Trattoria Altanella is a small family-owned restaurant located on an active canal in the midst of a neighborhood of apartments and walled-in homes. The restaurant is situated between the Palanca, and Redentore Waterbus stops. Walk 200 feet down alley-sized Sestiere Street to find the entrance. Although the building is older, the restaurant was started in 1920 by Nane Stradella and his wife Irma and is now in its fourth generation of family ownership. While the interior is dark, colorful framed paintings enliven the walls, creating a friendly and artistic atmosphere. There is even a historic drawing of the 19th-century building on the wall. During the summer, guests can eat on the roofed deck, enjoying the cooling sea breeze with excellent views of the canal and lagoon in the distance. The Trattoria’s food and wine prices are more in line with a fine dining establishment. 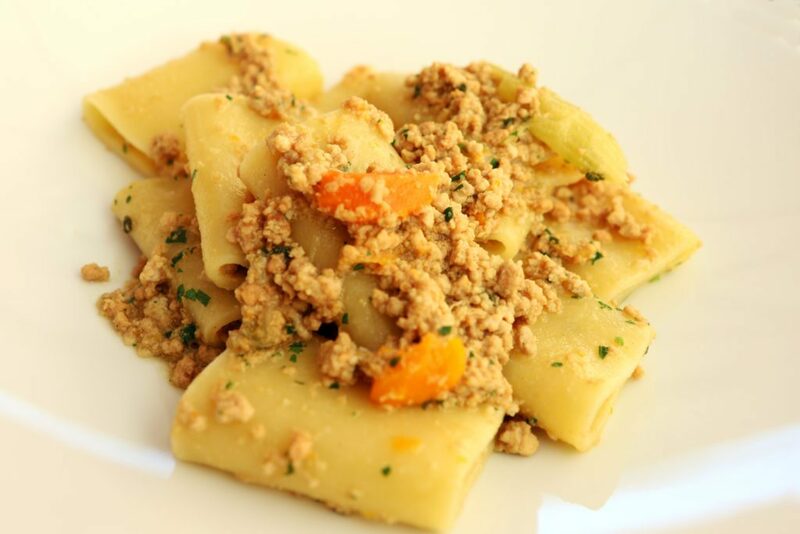 They have many fresh fish, pasta and meat dishes, and their wine list is extensive. Try it for a special celebration! Reservations suggested. Open for dinner only, 7:30 p.m. – 10:00 p.m. Admission Cost: €12, student and group discounts offered. The museum is near the Waterbus stop Zitelle. The Island of Murano is a must-see while in Venice and is world famous for its blown glass vases, glassware, and artwork. Known most affectionately as the “Glass Island,” it has several facilities where visitors can tour and observe the glass-blowing process up close. Beautiful hand-blown glass artwork is shipped from Murano to customers and shops around the world. Murano is easy to get to via the Vaporetto. If you want to view glassblowing, get off at Colonna, the first stop. A series of wooden bridges connect the island’s many canals. You will encounter a plethora of gift shops and glass factory outlets selling gorgeous vases, glasses, and chandeliers. There is also a store selling a wide variety of mosaic tiles and accessories for artists. Our favorite gallery on the Island of Murano is that of Simone Cenedese, probably the most exquisite contemporary glass artist on the island. His two-story gallery displays original colored glass jewelry, vases, vessels, and chandeliers. His staff is amiable and accommodating. 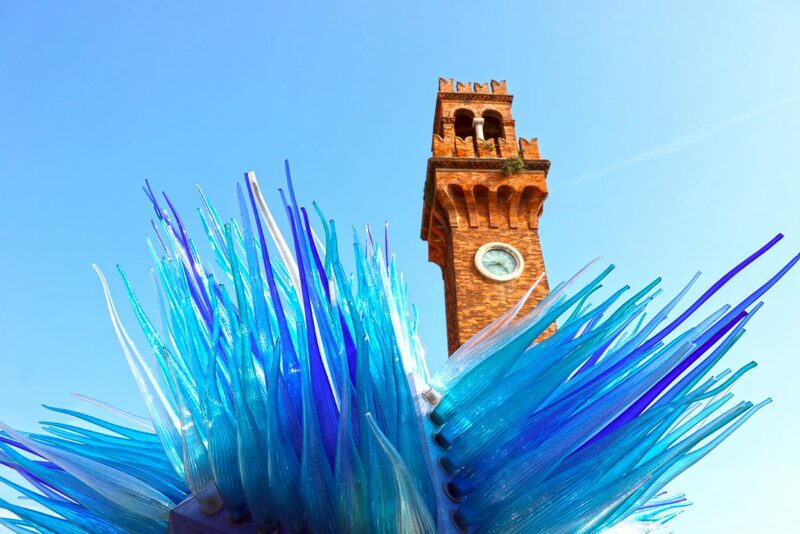 Simone Cenedese’s large “Comet Glass Star” glass sculpture is on display on the Campo San Stefano near the Murano clock tower and the San Pietro Martire Church. There are a few dozen restaurants with dreamy canal-side tables. Most boast touristic three-course lunch deals for €15. You can order vino locale by the half liter at €7, or 1.5 liters at €14. This well-appointed hotel is surrounded by the walls of a former glassmaking furnace. It has 118 modern rooms and a stylish restaurant and bar. 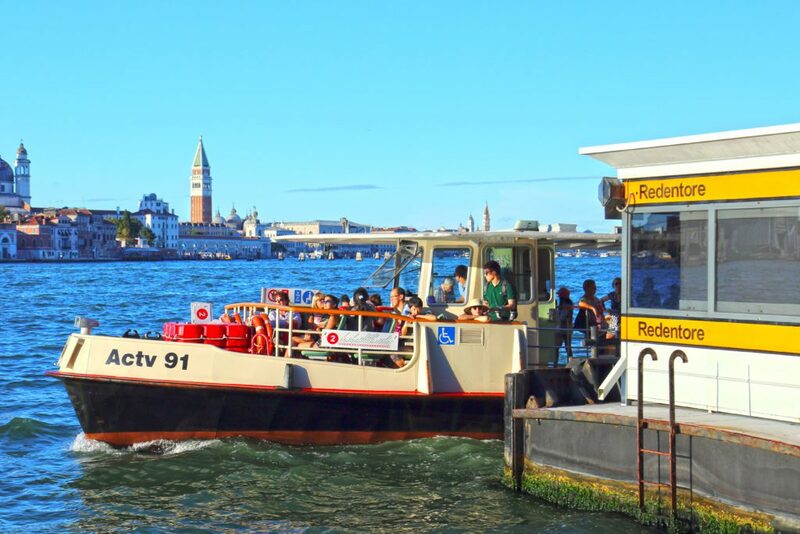 The hotel offers a complimentary waterbus shuttle to the Venice airport. Burano is a magical island jam-packed with rainbow-hued houses, canals and wooden footbridges linking the pedestrian walkways. Make sure to bring a camera for lots of photo memories; the island’s spectacular colorful beauty will brighten anyone’s day long after you are back at home! It is also known as “lace island,” famous for its original Burano lace pillows, textiles, and clothing. Burano offers good restaurants specializing in ultra-fresh fish and risotto de gò. Many of the restaurants provide touristic three-course lunch deals and Vini di locale wines by the pitcher. Connected to Burano by a wooden pedestrian bridge, the tiny island of Mazzorbo is home to Venissa, a unique wine resort complex operated by the multi-generational Bisol family, one of Italy’s top Prosecco producers. At the Venissa complex, the Bisols planted the Dorona grape, a long-lost Venetian variety, the only operating vineyard in Venice to do so. This golden grape was virtually extinct a decade ago but was brought back to life by the Bisols, who found some small surveying vines in residents’ vegetable gardens and grafted them onto rootstock. Today their 2-hectare vineyard produces a small annual batch of wine; the hand designed wine bottles are labeled with a very expensive, hand-produced gold leaf label, fired and blended into the glass. Each bottle is numbered by hand making them a collectible long after the wine has been consumed. The Venissa wine resort has lovely luxury suites, an Osteria and a famed, Michelin-starred restaurant to satisfy every discriminating gourmand’s palate. The restaurant closes down for winter and reopens in April. Reservations are a must, as this is the Venetian equivalent of Thomas Keller’s French Laundry. I discovered your site from Google and I need to state it was a wonderful find.